There are many children and adults who dreamt of being a Policeman in future and serve their country. In order to keep their dream closer, they also draw Policeman pictures and paste them in their rooms. Furthermore, there are many children whose adults are in Police Force. In order to give them surprise children use to draw Policeman sketch especially for them either on a chart paper or on the greeting cards. Furthermore, in school drawing competitions also children use to draw Policeman images and also won prizes for that. If you are also one of those, who admire Policemen and wants to draw Policeman then this tutorial is especially meant for you. In this tutorial, we have given step by step instructions to draw Policeman. So if you are willing to complete the Policeman full body pencil drawing then you must consider this tutorial once. The main task of Policeman is to serve the country by saving its people from the evil forces and also completes their duty with full pride and honesty. Each country has its own police force. Furthermore, every Police force has its own Dress Code. 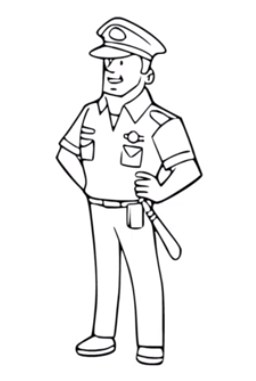 In this tutorial, we have given the Policeman full body pencil drawing with a common dress code so that you can color it according to the requirement. With the help of below given illustrated video link, you will be redirected to a video having the detailed tutorial on How to draw Policeman step by step| Policeman full body pencil drawing. To completely understand the pencil drawing steps you are suggested to watch the video till the end. After going through this tutorial, it will definitely become easier for you to complete the Policeman full body pencil drawing. If you have any sort of confusion regarding the details given by us in this tutorial then you may either watch the video again or also can ask us by stating your comments in below-given comment box. Furthermore, if you want to watch more such tutorials then you may visit our channel regularly. In order to get all the related updates directly in your mailbox then you may also subscribe to our free mail service.